Michael Jordan played in a game wearing # 12 for the Chicago Bulls. 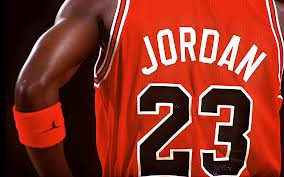 Michael Jordan was born on February 17, 1963 in Brooklyn, New York. He is the fourth of five children. He attended the Emsley A. Laney High School in Wilmington where he began his athletic career. He tried several sports apart from basketball at school. In 1981, Jordan earned a basketball scholarship to the University of North Carolina at Chapel Hill, where he majored in cultural geography. National Basketball Association (NBA) termed him as the 'By acclamation, Michael Jordan is the greatest basketball player of all time'. Michael Jordan was 3rd pick in 1984 NBA draft. Michael Jordan majored in Cultural Geography. MJ has never allowed a game 7 in the NBA Finals to take place. He has won all six of his NBA finals without having to play in game 7, finishing all but one in Game 6 (Bulls beat the Lakers in 1991 in five games). Jordan joined the NBA's Chicago Bulls in 1984. MJ’s dad who was also his first trainer was murdered while sleeping in a car. MJ ate the same meal four hours before each game, a 23-ounce New York steak and either a baked potato or mashed potatoes a salad, and a ginger ale. In 1999, he was named the greatest North American athlete of the 20th century by ESPN, and was second to Babe Ruth on the Associated Press's list of athletes of the century. He was inducted into the Basketball Hall of Fame in 2009. MJ lists Laker legend Jerry West as the person he wanted to play one-on-one with. Jordan also starred in the 1996 feature film Space Jam as himself. He played on two Olympic gold medal-winning American basketball teams. He is one of the most marketed sports figures in history. Twice in his career he played a game in which he only scored 2 points. Nike created a signature shoe for him, called the Air Jordan. Michael Jordan idolized his brother Larry who wore 45. He couldn’t pick 45 so he picked 23 which is half of 45 rounded up to 23. MJ is petrified of water, he watched his friend drown to death and almost drowned himself as a kid. His yearly income from the endorsements is estimated to be over forty million dollars. He proposed to his long time girlfriend, Cuban-American model Yvette Prieto, on Christmas Eve, 2011 and is engaged to be married. In 2012, he listed his Highland Park mansion for sale.